"it’s funny, fast and furiously violent." "It makes most Canadian TV series look lame, tired and bloodless." "If your taste runs to a sharp but ridiculous spoof of gangster drama clichés, with a lot of elaborately foul mouth dialogue, this is for you." "A touch of the Coen brothers here – the intriguingly clever, deadpan style, the scenes that occasionally go on forever because the rich, absurd dialogue (that) should be relished." "A nice step forward in Canadian TV...It’s just ridiculously cheerful about degenerates, drug addicts, hookers and absurdly violent criminals. It delivers a good laugh, if you have the stomach for it." 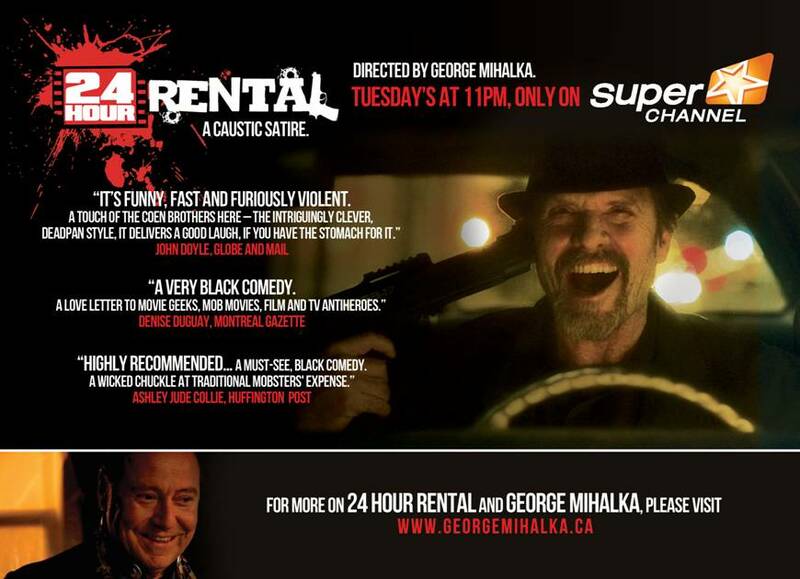 "if you're into having a wicked chuckle at traditional mobsters' expense, check out 24 Hour Rental"
"A very black comedy, 24 Hour Rental is a hilarious, ultraviolent sendup of and love letter to movie geeks"